The Iowa Communications Network worked with Christie and CCS Presentation Systems to install a Visual Presence Monitoring System within its Broadband Information Center, or BRIC. This created a collaborative tool for additional visibility to monitor its state-wide broadband network. The Iowa Communications Network is a state-owned telecommunications network with over 8,000 miles of owned and leased fiberoptics and copper cable providing broadband access to government, education, public safety, and healthcare sectors in Iowa. ICN moved operations out of a bullpen type configuration, with employees viewing information on desktop computers, to a purpose-built area for the BRIC. The BRIC comprises 12 Christie FHD552-X55-inch flat panels and nine Christie Phoenix nodes. The flat panels are arranged in two separate configurations: the main video wall has eight flat panels in a four by two arrangement, and the second video wall has four flat panels in a two by two configuration. All 12 panels are driven by the Christie Phoenix nodes and were designed and installed by CCS Presentation Systems. The Christie flat panels display gives additional visibility to network outages, allowing ICN to respond when cyber-attacks are identified on the network or other security issues arise associated with critical infrastructure being served by the ICN. 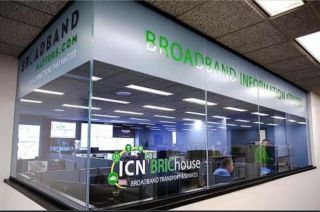 A future goal is to sync the BRIC’s video wall to various locations, such as ICN’s 24/7 Network Operations Center located 13 miles away.